C.J. Martin is a Level 4 CrossFit instructor, USA Weightlifting Coach and former member of the CrossFit HQ training team. He believes that fitness is a medium for learning to cultivate an unconquerable mindset that will lead to not only improved health, but also happiness and success in all aspects of life. He fosters a positive training environment to help clients overcome self-doubt or perceived limitations to achieve their full potential. C.J. approaches each athlete’s goals as a fun and unique challenge, so whether they desire to lose 100 lbs or compete for a world championship, the process of educating, supporting and encouraging them to goal achievement remains the same. C.J. has coached more than 50 individuals and dozens of Masters athletes to the CrossFit Games. He has also coached Team Invictus to the CrossFit Games for 10 consecutive years. 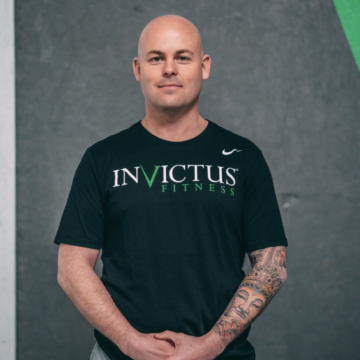 He has worked with athletes around the world through online coaching and program design since 2009, but still prefers the day-to-day interaction with athletes of all ages and abilities that walk through the doors of Invictus’ physical facilities. He is also co-founder of Kids Helping Kids, a non-profit organization that has raised over $5 million for neo-natal intensive care and pediatric units throughout Oregon.